Rio is a city of contradictions. Incredible mountain formations and beautiful beaches are set amidst run down city streets and hillside favelas. On the second day of our one-week visit, Michael got food poisoning – again. Rio de Janeiro is our first South America destination – the final continent in our trip around the world. We are excited about the next two months because neither of us has been to South America. Our visit got off to a good start. The night we arrived, we had a yummy dinner at Botequim Informal near the hotel. Then, the next day a workout and long walk on Copacabana Beach. For dinner, we almost went back to Botequim but decided to try somewhere new. The atmosphere at Charleston Bubble Lounge looked really cool, so we decided to give it a try. The restaurant was empty, as it was when we walked by the previous night. We figured that maybe it was more of a late night bar versus a dinner spot. Dinner started out great – a bottle of cava and incredible mushroom bruschetta appetizers. But then it plummeted when the entrees arrived. Lori’s meat was really tough and the sauce was a bit strange. She ate the potatoes and took the rest to go (Michael is good at repurposing food, so we thought it might taste ok turned it into a sandwich). Michael had mussels, which didn’t taste super fresh – but he ate them anyway. The next morning after breakfast, the food poisoning symptoms set in. Luckily, this time was very mild compared with Cambodia. Michael didn’t need to medical treatment. After lots of cipro, Tylenol, and two days of bed rest he was feeling good enough to get up. Yes, we should have sent the entrees back, but didn’t. We learned our lesson! Due to Michael’s food poisoning, we only had two days to check out Rio. Rio has a reputation for not being the safest city. We read a news story about violence against two tourists on public transportation in Copacabana (where we stayed), Rio gang who raped American tourist jailed. And, we didn’t have a lot of confidence in the taxis because we were overcharged for the ride from the airport to hotel. So, we did something we don’t usually do – went on two group sightseeing tours that we booked through the hotel. One was really good; the other was so so. There were two sights that we didn’t want to miss: Corcovado / Christ the Redeemer statue and Sugar Loaf. The Rio Express tour with Via Copa included a visit to both sights with a drive through the downtown area in between. It took one hour to get from Copacabana to Corcovado. 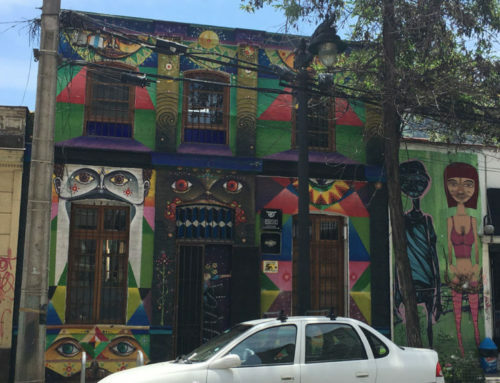 The last part was a drive through the steep, winding hills of Santa Teresa – one of Rio’s wealthier neighborhoods. We saw some cool street art and Michael snapped a few shots, but they were all blurry because the van was driving fast. After entering the park, there was another drive in a park van to the top of the hill. 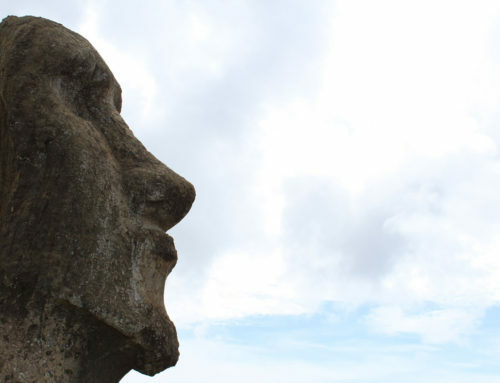 After walking up some stairs, we saw the 710-meter tall statue towering above incredible views of the city and ocean. 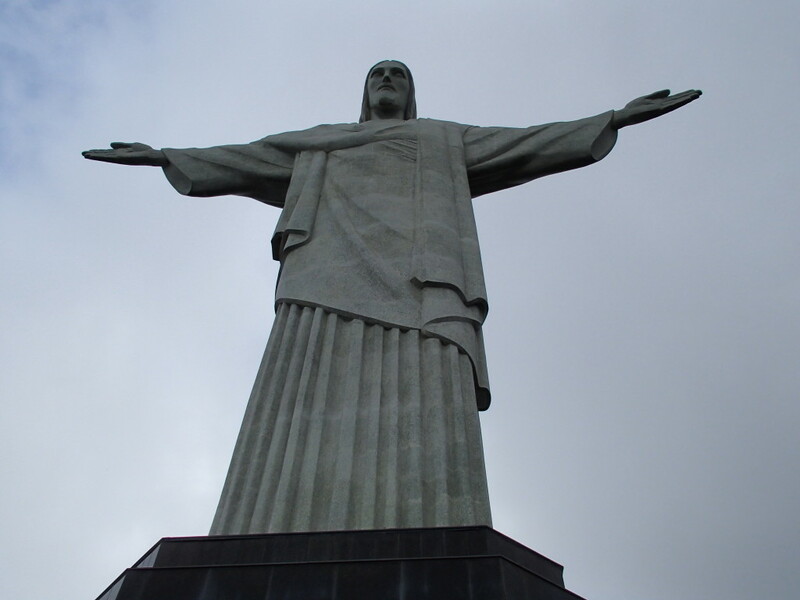 The Christ the Redeemer statue was completed in 1931 and took nine years to build; it is quite impressive. 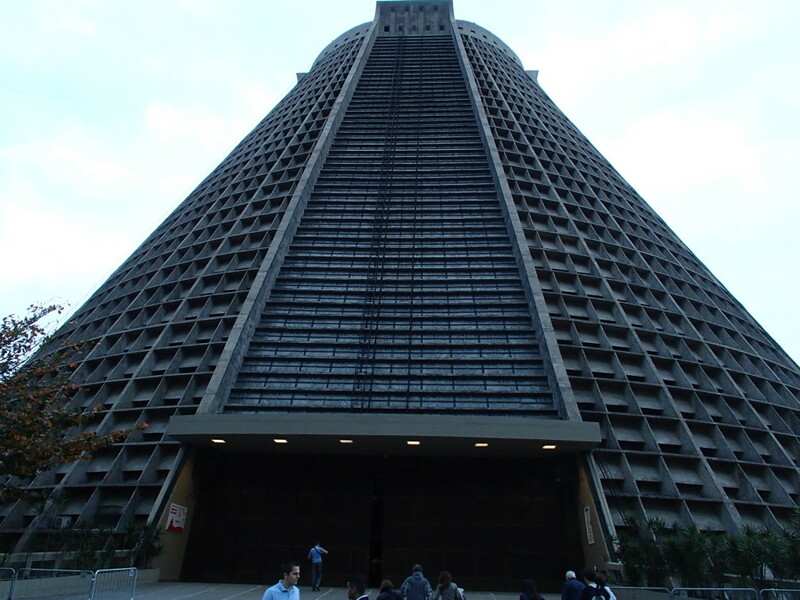 After leaving Corcovado, we headed for Sugar Loaf on the other side of the city, passing through the downtown area (centro). The city center is a bit run down; some of the buildings looked like they were really nice at some point. There was also a quick stop at the interesting modernist Cathedral of Saint Sebastian. We arrived at Sugar Loaf in the evening, so it was dark and not very crowded (unlike Corcovado). To get to the top, we rode a cable car to a midpoint mountain and then took a second car to the top. At the top, there’s a short walk through a jungle area to a lookout point with shops, tables, and a snack bar. Along the walkway, there were signs instructing ‘don’t feed the animals’. Since it was dark, we didn’t see any animals and we’re not sure which types live there. The nighttime view with city lights was amazing! But we didn’t have much time to enjoy it because the guide hurried us back to the cable car after about ten minutes. Tour Impressions: The van arrived 25 minutes late. We were the last to be picked up, so there were no seats together. For the first leg, Michael got a window seat and Lori was smashed in the backseat with a family. On the rest of the legs, we were able to sit together, but in the back row. The seat backs were tall and the windows were tinted, so Lori couldn’t see very much. We had about 30 minutes at Corcovado, which was good, but only ten minutes at the top of Sugar Loaf. At the end, the guide asked for a tip and passed around an envelope – tacky. This five-hour tour is a good option if you are on a budget because it includes transportation and entrance fees. But the transportation was uncomfortable (if you are short and don’t get a window seat, you won’t see much) and there was not enough time at Sugar Loaf. If we didn’t have the time constraints, we would have researched a private tour or driver so we could have explored at our own pace. 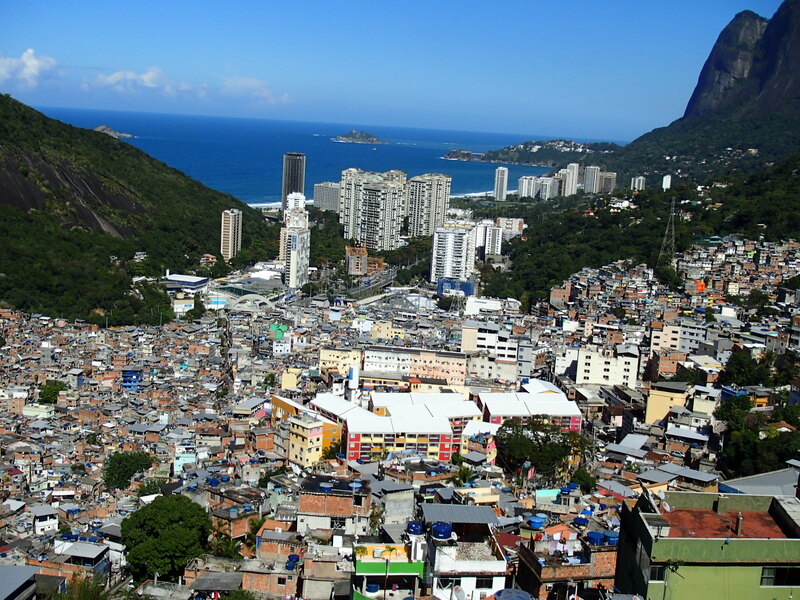 Ten percent of Rio de Janeiro’s population lives in a favela: Rocinha is the largest. The three-hour tour with Jeep Tour started with a 30-minute open air jeep ride to the top of the favela. 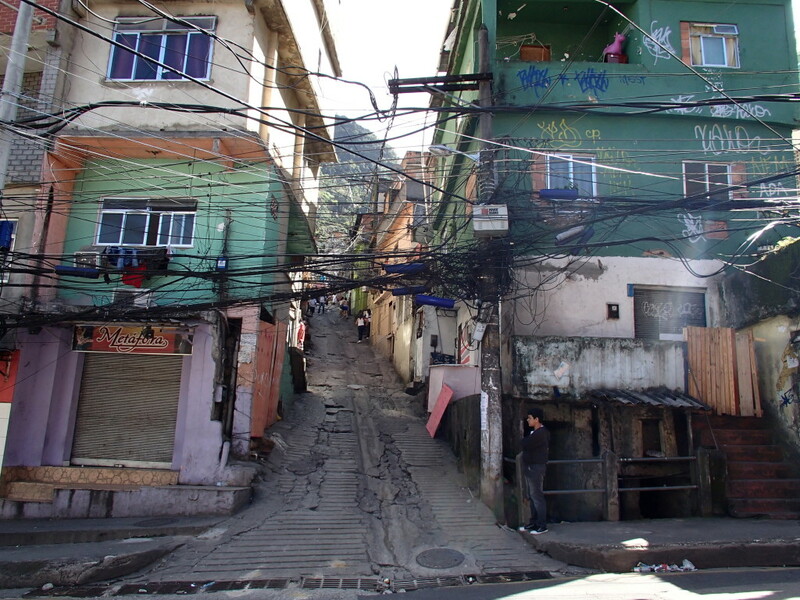 Then we took a leisurely two-hour walk through the favela down to the bottom of the mountain. 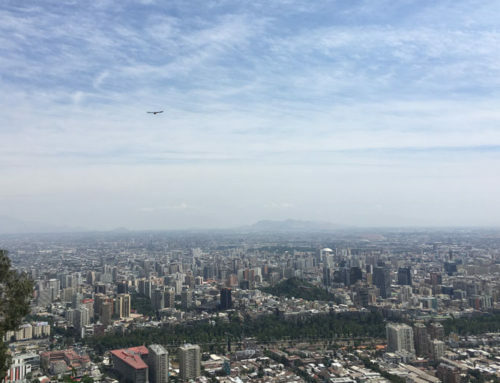 First we stopped at a resident’s home for a long climb up a steep staircase to a stunning rooftop view. Then we walked down narrow streets and alleyways past homes, grocery stores, produce and meat markets, the library, school, and gym. Along the way we saw regular people going about their lives, well cared for dogs going about their business, street art, dangerous-looking power lines with way too many wires, lots of trash piled in street side collection areas, heavy traffic congestion, a rat, and a chicken. The jeep met us at the bottom of the mountain and then we drove back to the hotel. On the way, we passed by Rodrigo de Freitas Lake at the base of Corcovado – a peaceful area where residents jog, bike, and boat. And then we followed the coast through Leblon and Ipanema. Tour Impressions: The jeep arrived 10 minute late. We liked the small group atmosphere (9 people) and chatted with some interesting travelers. Our guide, Luciano, was friendly and engaging. As we walked through the favela, we did not feel unsafe, although we would probably not visit without a guide just in case. A favela tour is a must do when you visit Rio de Janeiro! 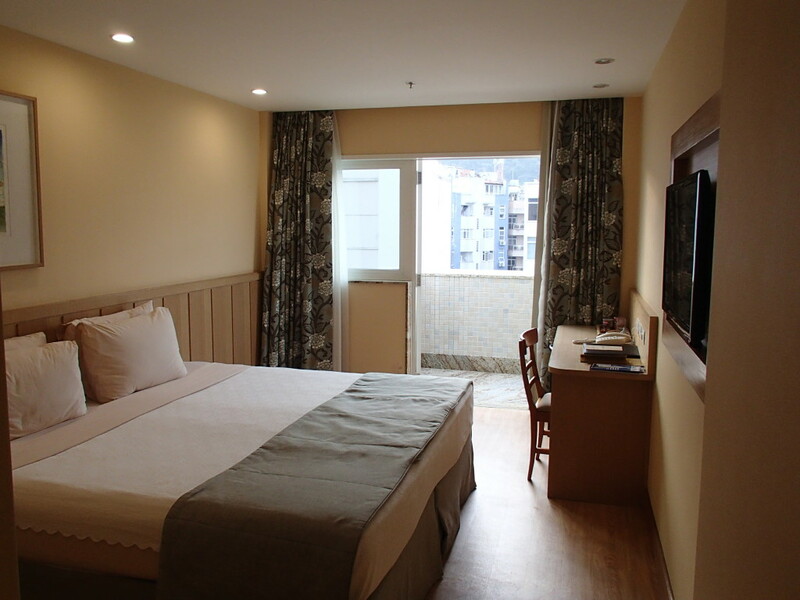 If you want to get even more immersed in the favela lifestyle, you can arrange a home stay with Favela Experience. Rio de Janeiero has some of best urban beaches we have seen – long stretches of pure white sand; clean, clear water; and mountain views at every turn. Copacabana runs for .5 miles and then Ipanema takes over for another 1.25 miles. 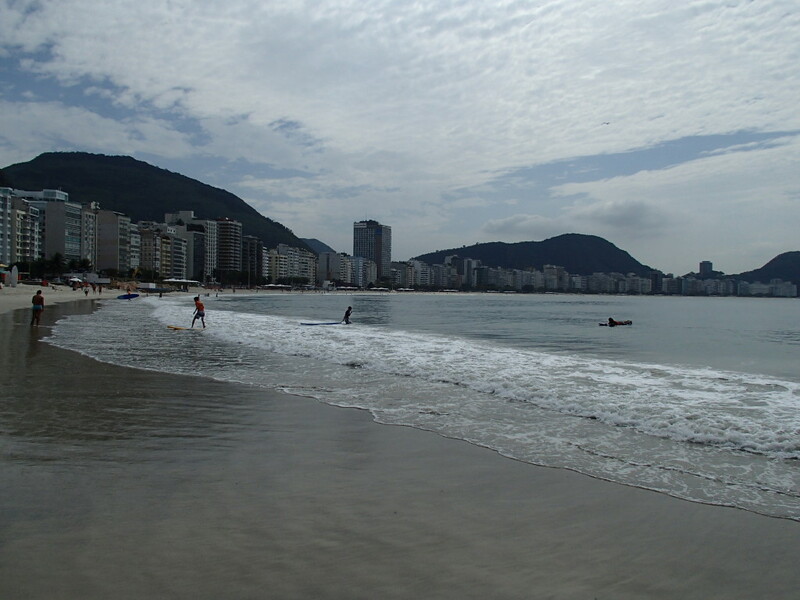 Ipanema has a stronger surf and is considered a more upscale neighborhood. Other than that, the beaches are very similar. Small bars/kiosks and public restrooms line the beach and there is a wide pedestrian promenade. Since we went in Brazil’s winter, the temperature was warm enough to walk on the beach most of the time (except for a few rainy, chilly days) but the beach was not crowded. Casual dinner: We ate at Botequim Informal three times and had a really good meal every visit. 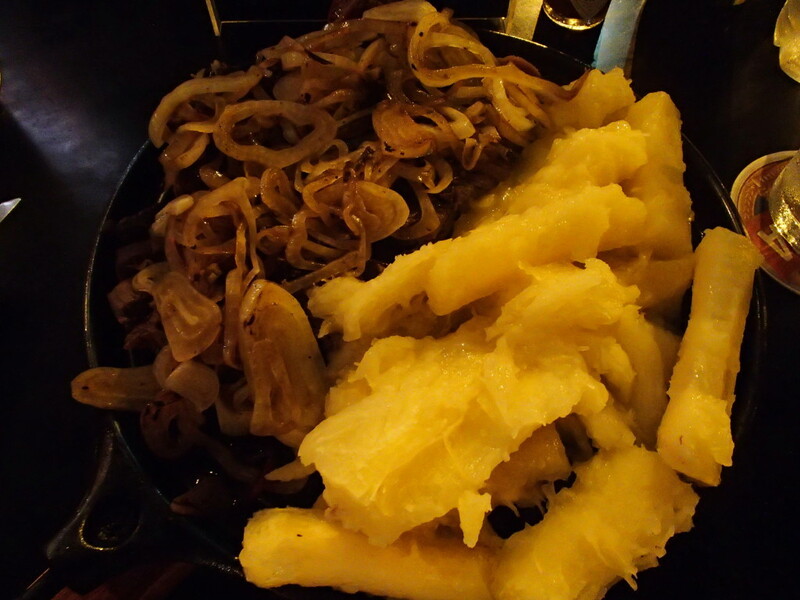 Try the calamari appetizer and grilled meat platters for two. DON’T EAT HERE: Michael got food poisoning at Charleston Bubble Lounge (Rua Rodolfo Dantas 26-B, Copacabana – near Copacabana Palace Hotel). The restaurant is not on Tripadvisor, so we could not post a warning to others. So if you know anyone who is going to Rio, please spread the word. Visa: At the time of our visit, Americans were required to get a Brazil visa in advance of entry. Check the most current requirements when you start planning your trip. When to go: We arrived in late winter, the low season, and thought it was a great time visit. The weather was very comfortable and the beach wasn’t crowded. But, if you want to spend the entire time on the beach and like all of the activity and people watching, you may prefer a different time of year. While some days were good for the beach, there were a few chilly, rainy days. Airport transportation: We got complacent in Europe because taxis are metered and, from our experiences, charge fairly. So we didn’t research airport transportation before landing in Rio and ended up paying way more than we should have for the ride to the hotel. There are metered and non-metered taxis. The non-metered drivers quote a price before you get in, which is way more than a metered taxi charges (in our case, about $15 more). Know what a taxi should cost to/from the airport. Try to get a metered taxi and if you take a non-metered ride, be ready to negotiate. Getting around Rio: The popular attractions in Rio are very spread out. There is public transportation: metro, bus, van, but they are crowded and have a reputation for not being the safest. If you are on a budget, a group tour is an easy, safe way to get around, although you lose flexibility. Another option would be to hire a private guide or driver. Expect long travel times to get from place to place. Beach restrooms: There are public restrooms along the beach, but they are not free, so bring coins when you go to the beach. Corcovado: After you enter the park, there are two ways to get to the Christ the Redeemer statue: van and train. Our tour went by van, but it looked like the train would be much more fun because it winds through Tijuca Forest. 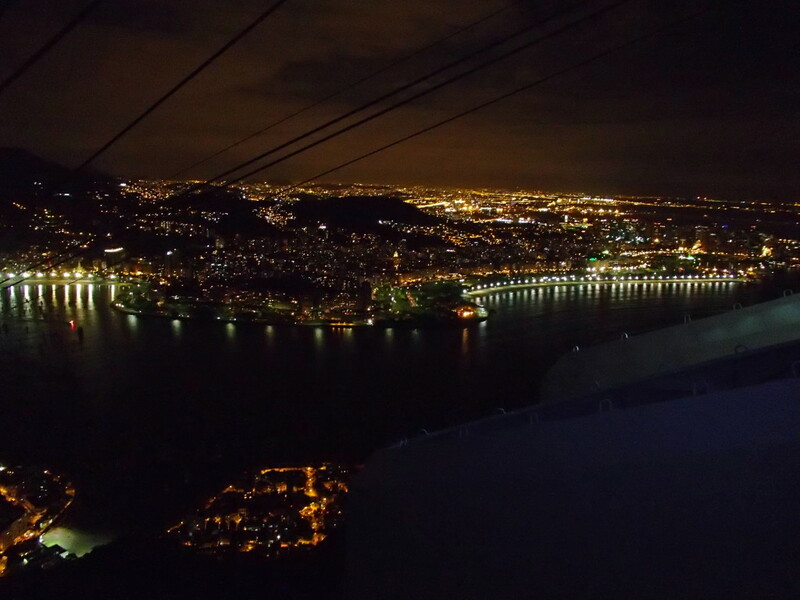 Sugar Loaf: We visited in the dark and the city lights were awesome. After seeing the views from Corcovado during the day, it was a nice contrast. We read that sunset is a great time to visit Sugar Loaf.